You started off with a default notebook when you created your Evernote account so it only stands to reason that you would start off with a default first note. Read through that note as it gives some helpful hints on how to get the most out of your Evernote account. Once you are finished with the welcome note, you are ready to get started creating notes of your own. Anything you want to add is fair game; after all, it’s your notebook! If you like to make lists, you can create a grocery list or a to-do list. 1Click the +New Note button on the top menu bar. An untitled note is created. 2Give your note a title. Click the box that says Untitled and enter your title. 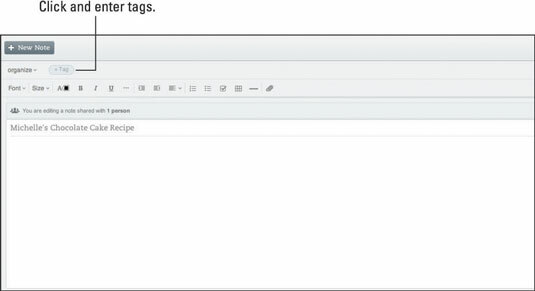 3Tag your note by clicking the +Tag button right above the text formatting bar and typing the tag. Use descriptive words for your tags. Here, the tags desserts and chocolate cake were entered. 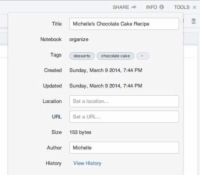 Evernote uses words in the title and tags to search for information, so assign a descriptive title and a tag to the note. 4To add a Reminder, click the Reminder button. It looks like an alarm clock on the right side of the screen. Adding a reminder is easy. 5(Optional) Click the calendar icon next to the Reminder Added dialog box and pick a date on the Notify Me calendar that opens. Press the Enter button on your keyboard. 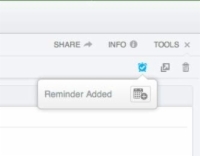 If you do not select a specific date by clicking on the calendar icon, Evernote just lists your reminder in the left side bar under the Reminders heading. 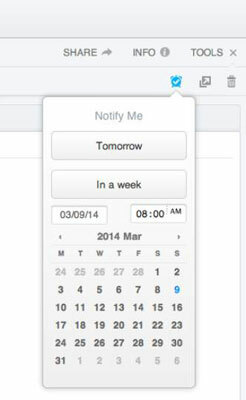 If you select a date and time for a reminder, a notice will appear on your screen at the selected time. After you set a reminder, it is added to the left sidebar under the Reminders heading. You can also receive an e-mail reminder on the date you specified. After you set the first reminder on your new Evernote account, a dialog box appears in the left sidebar asking whether or not you want to receive an e-mail on the day you chose for your reminder. Click Yes if you want to get e-mailed reminders or No if you don’t. 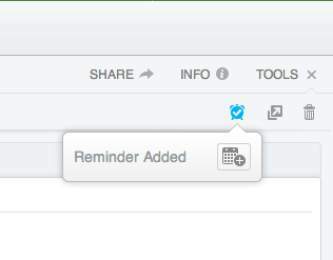 Clicking the shield icon gives you more control over what reminders you see and how you want them to be sorted. 6Click the body of the note to enter the note’s contents. The formatting toolbar becomes visible. 7To assign a URL, set a location, or see other useful descriptive information about a note (including revision history), click the Info button to open the metadata dialog box. 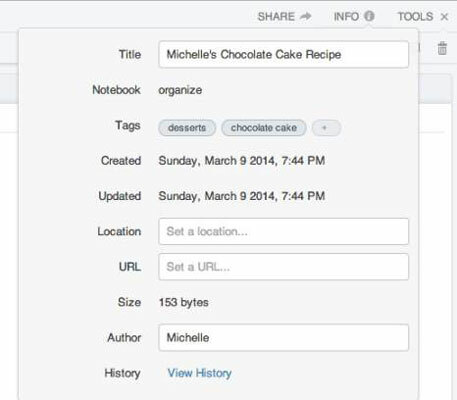 View and update descriptive information (metadata) about a note. 8In the dialog box that appears, type a URL. Assigning a URL makes sense, for example, if you’re abstracting an article and want to refer to the source. 9Clicking anywhere outside of the dialog box closes it. Your note is saved automatically as you go along. All your notes are listed in the left pane. Clicking a note makes it active (indicated by the shading) and opens it in the right pane. A note isn’t a dump. The purpose of saving notes is to allow retrieval as needed. Although Evernote can find whatever you save, you’ll find that intelligently titling notes, organizing them in logical collections (notebooks), and tagging them judiciously will dramatically reduce retrieval times without slowing you down while you’re capturing other information.